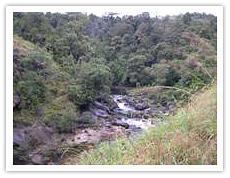 "Towards Resilient Ecosystems:The Role of Forestry Research"
Undertook Species Recovery Research on threatened species of medicinal plants in Silent Valley and Kolli Hills Medicinal Plant Conservation Areas (MPCA) of Kerala and Tamil Nadu, which involved the assessment of status of population of 21 threatened medicinal plants, mapping their distribution at these sites, seed biology and reproductive biology studies to develop strategy for long-term conservation of Rare Endangered and Threatened (RET) species of medicinal plants. Majority of the species showed contiguous distribution in both the sites. 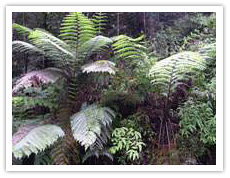 In general, Aphanamixis polystachya Canariun strictum, Cinnamomum sulphuratum, Embelia ribes, Glycosmis macrocarpa Hydnocarpus alpina, Nothapodytes nimmoniana, Aristolochia tagala and Raphidophora laciniata are found to be threatened in varying degrees. This study has been conducted in collaboration with State Forest Department of Kerala and Tamilnadu and Foundation for Revitalization of Rural Health Traditions (FRLHT), Bangalore. Silent valley National Park is one of the biodiversity hot spots in India. Low elevation grasslands in the park gradually are changing into forested land. But earlier observations showed that the regeneration of trees in grasslands was slow and species coming up in the grassland were of deciduous type. But along the ecotone areas majority of species are evergreen. Due to the protection provided to the area over a period of time many changes have occurred in the vegetation. By studying the regeneration pattern among the trees and other woody elements, one can predict the future of the vegetation in the park and can suggest management measures if necessary. Keeping these facts in view this study was proposed to achieve the objectives 1). Study the dynamics of natural regeneration of woody species in different forest ecosystems in Silentvalley National Park and 2). identification of problems of regeneration specific to the dominant species through phenological, demographic and phytosociological studies. Natural regeneration studies on important trees in Silent valley National Park are being undertaken and it is found that trees like Careya arborea, Dalbergia lanceolaria, Elaeocarpus serratus, Glochidion arboreum, Maxtixia arborea, Neolitsea scrobiculata, Phyllanthus emblica, Symplocos cochinchinensis, Syzygium cumini, Wendlandia thyrsoidea and Zyziphus rugosa regeneratewell in grasslands. Bees form a vital part of many natural and farmed landscapes all over the world. Both as pollinators and as part of the wider insect community, their activities not only promote healthy ecosystems, but also in many cases they are essential to the life cycles of particular plant species. Bees and plants have co-evolved through millions of years of evolutionary history and both are innately interdependent for each other’s survival. Bees are the best pollinators (responsible for about 80 percent pollination) of many agricultural and horticultural crops and forestry species and they play a significant role in the fertilization of flowers and improvement of quality and quantity of yield. Plants like Orchids have specialized pollinators and their absence in the ecosystem may lead to poor seed production, regeneration, dwindling of population and rarity. Bees are under pressure everywhere, both from the direct impact of pesticides in the environment as well as habitat alteration and destruction. The Nilgiri district of Tamil Nadu form an important area of the Nilgiri Biosphere Reserve. The area has distinct phytogeographical features and shelters about 183 species of endemic, rare and endangered plant species coming under 41 families. The elevation of the area ranges from 300m to 2600m above msl. Most of the familiar types of South Indian forests are represented in the Nilgiris, together with a few that are peculiar to this hilly tract alone. Since the middle of 19th century, the hills of the Nilgiris have been the spot of large-scale plantation activities. Many plantation species/ crops (Tea, Coffee, Cinchona, Eucalyptus spp., Acacia spp., Pinus spp. etc.) were introduced and few alien invasive species (Ageratina adenophora (Eupatorium glandulosum), Ulex europeus, Cytisus scoparius, Lantana camara, var.aculeata) colonized the cleared areas. Therefore the ecosystem of the hill tracts has been modified to a great extent. This could have direct impact on the bee fauna of the area, as they are reported to be very sensitive to even minor changes in the ecosystem. Almost all the crops grown in this mountainous tract needs the pollination services from the bees for fruit / seed production and the forest plants require them for their reproductive cycles to continue and for maintaining the diversity through cross-pollination. The studies envisaged will throw light on species richness of bees and diversity, association with various plant species and the factors posing as threats to their existence, so as to evolve suitable strategies for ensuring their sustenance in the ecosystem. Alappuzha is the smallest (1414 km2 area) district in Kerala with a high population density and is the only district in the state without natural forests. However, sacred groves generally known as ‘Kavu’ varying in size from small patches of few trees to many acres exist in the area and most of the them are owned by ancestral families / temple trusts. The sacred groves of the district attract utmost attention, as they are the only remnants of evergreen forests once present. Since sacred groves represent the past status of vegetation and biotic and abiotic diversity of the region, an in-depth assessment of these natural resource pockets can be an excellent tool for any regional biodiversity planning. A project entitled Status and Floristic Diversity of Sacred Groves – The Only Remnants of Natural Forests in Alappuzha District, Kerala has been funded by ICFRE.